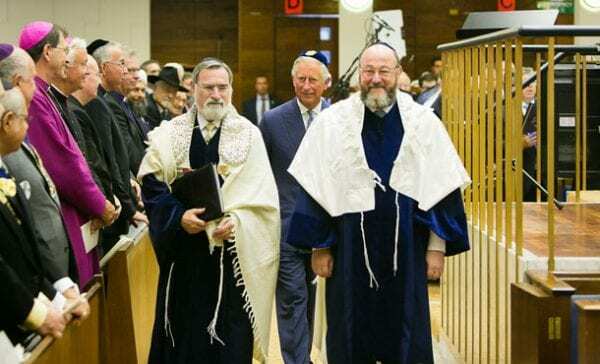 South African-born Rabbi Ephraim Mirvis has been installed as the Chief Rabbi of the United Hebrew Congregations of the Commonwealth at St John’s Wood United Synagogue in London in the presence of HRH The Prince of Wales. Among those who attended were senior members of the Government and Opposition, Members of Parliament, Members of the House of Lords, several European Chief Rabbis, representatives from other synagogal bodies and from the Commonwealth, and leaders of other faiths andover 1400 guests from across the Jewish community. The installation service will include readings by Head Boys and Girls from Jewish secondary schools, an induction address by Chief Rabbi Lord Sacks and an installation sermon by Rabbi Mirvis. Rabbi Ephraim Mirvis was appointed 11th Chief Rabbi of the United Hebrew Congregations of the UK and the Commonwealth in December 2012. Rabbi Mirvis has earned a reputation as one of the UK’s most respected community Rabbis, until May 2013 serving as the Senior Rabbi at Finchley United Synagogue, (known as Kinloss) a community of well over 1,800 members. In this role since 1996, he has galvanised the community and been responsible for founding pioneering education projects, such as the Kinloss Learning Centre and is the founding Principal of local Primary School, Morasha. As Chief Rabbi of Ireland from 1984 to 1992, Rabbi Mirvis represented the Jewish community to government, other faith communities and the media. He joined the UK Rabbinate in 1992 when he was appointed as successor to Lord Sacks at the prestigious Western Marble Arch Synagogue in London and was appointed to the Chief Rabbi’s Cabinet in 1996. He was born in 1956 and raised in South Africa. Rabbi Ephraim Mirvis gained a BA in Education and Classical Hebrew from the University of South Africa and received his rabbinic ordination from Machon Ariel, Jerusalem (1978 – 80), having also studied at Herzlia High School, Cape Town (1968 – 73), Yeshivat Kerem BeYavne (1973 – 76) and Yeshivat Har Etzion (1976 – 78). Rabbi Mirvis has held educational and community positions in Israel, Ireland and the UK. He was the Chief Rabbi of Ireland (1984 – 92), a position previously held by Lord Jakobovits, and Rabbi of the Western Marble Arch Synagogue in London (1992 – 96), a position previously held by Lord Sacks. He has been a member of the Chief Rabbi’s Cabinet since 1996 and was Chairman of the Rabbinical Council of the United Synagogue (1999 – 2002). Rabbi Mirvis joined the Finchley community (Kinloss) in May 1996. Under his leadership, the congregation has been transformed into a vibrant powerhouse of educational, social, cultural and religious activity and, for the past two years, the fastest growing community in the United Synagogue. At Kinloss, Rabbi Mirvis is the Founder and Director of the popular community education programme, the Kinloss Learning Centre (KLC), which has attracted hundreds of participants on a weekly basis since 2003 and has been an innovative model that many other communities have adopted. He is also the Founder Rabbi and Honorary Principal of Morasha Jewish Primary School. Rabbi Mirvis has led many successful campaigns. As Chairman of the Irish National Council for Soviet Jewry (1984 – 1992), he lobbied successfully against the request of Nazi War Criminal, Pieter Menton, to reside in Ireland. He has been Guest Speaker and Scholar-in- Residence at numerous communities and campuses around the globe. He has written articles for newspapers and journals and has often appeared on television and broadcast on radio. Rabbi Mirvis’ wife, Valerie, is a local authority senior social worker who has carried out Frontline Child Protection for many years. Rabbi and Mrs Mirvis’ eldest child, Liora Graham, passed away in 2011, following a long battle with cancer. They have four sons, Hillel, Daniel, Noam and Eitan, a son-in-law, Jonathan, two daughters-in- law, Melanie and Althea, and several grandchildren. Sydney’s The Great Synagogue’s Rabbi Jeremy Lawrence told J-Wire: “I have known Chief Rabbi Mirvis for over 20 years. He is a committed leader and dedicated pastor with an excellent track record. I wish him luck”.